Paying attention to what we’re doing is a prerequisite for learning efficiently. This is fairly obvious and based in the idea that the brain learns from actively processing what we see and hear. For instance, we will learn more from what our teacher says if we listen attentively than if we daydream. We will learn more from what we read if we focus on the text rather than the attractive person sitting across from us at the cafe. This isn’t rocket science. Therefore, one goal of learning efficiently is simply staying focused and paying attention. This is easy in some cases, but hard in others. There are many situations where we can increase our awareness fairly easily and thus become aware of a lot more than we otherwise would and, as a result, learn more. Vocalising, or saying something aloud, is one way of doing this. In this article, I’m going to present three examples of vocalising that you can use to learn more from what you’re already doing without spending more time studying or making it significantly more difficult. They are all different, not only in form, but also in that you will learn completely different things. Try it for ten minutes next time you leave the computer (otherwise all you need to know is “keyboard” and “mouse”). I did this myself and found that there were quite a lot of things around me which are very common, but which I still didn’t know how to describe in Chinese. I did the same with English and found that there were some words I didn’t know as well! Depending on your language level, you can vary both the strictness of the rules and the duration of the game. For a beginner, it’s enough to be able to say “trousers” when dressing in the morning, but for more experienced learners, “button”, “zipper”, “pocket”, “belt” would also be necessary. Duration should vary according to difficulty, so my suggestion is that you stop once you’ve come across a certain number of words you don’t know, say five or ten. Then repeat the next day and see how much further you get. Think of this as a video game: How many days does it take until you’re able to reach breakfast? Work? Lunch? If you want to make this really fancy, try describing not only what you touch, but what movements you perform to do this. This is very hard to do well, though, and I don’t think it’s appropriate for beginners. Learning basic words is much more important than learning how to describe movements of the body. The idea of using everyday electronic devices such as computers and phones to learn languages is about as old as these devices and I think many of you have already switched your phone’s language to Chinese. 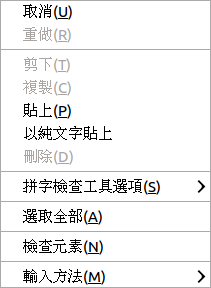 I’ve been running Linux in Chinese on my computer for many years and this is a natural part of any immersion program. However, there is a big problem. Did you ever play games in a language you didn’t know as a kid? I did, and I quickly figured out which number in the menu represented “save game” and which was “load game”, even if the language was Japanese (which I have never studied and have no means of guessing). The same happens with computers and phones. The picture to the right represents what my right-click menu looks like if I click in this very area I’m now typing in. The problem is that even if you don’t know any Chinese whatsoever, you can still cut, copy and paste text, because the letters are there. You don’t need to understand the characters. Even if there were no letters, you could still learn that the first one is cut, the second copy and the third paste. The way around this is to read these words aloud when you use them. Talk to yourself! When you cut or copy, say jiǎn qiē (TW: jiǎn xià) or fùzhì, when you paste the text again, say zhān tiē (TW: tiē shàng). 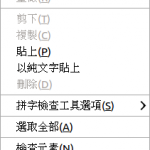 When you right click, say yòu jiàn, when you open a menu, read the text your clicking on. In essence, just like the first example above, read aloud whatever you touch with the cursor. Do this as much as possible, this is very intensive SRS indeed. When we listen passively to Chinese, it’s sometimes hard to focus on what’s being said. When I’m out jogging, I typically listen to longer radio programs, usually some kind of debate or interview that goes on for at least half an hour. During this time, it’s easy for the mind to slip and start thinking about other things. To stop this from happening too often, try repeating what the speakers are saying. This requires much more mental effort and is likely to give you a more lasting impression of the language they used. 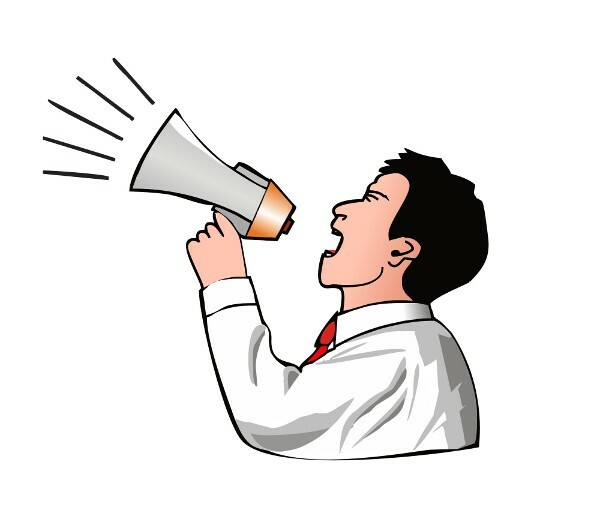 If it’s embarrassing or not suitable, try sub-vocalising instead (or, “say it in your head”). These are merely examples and there should be many other ways of using vocalisation to help you focus on what you’re doing. Reading aloud instead of silently is just one additional example. If you have any other suggestions or thoughts, please leave a comment! I once had a Chinese professor tell me the best way to learn new material was to do all of the following: read, write, speak aloud, and listen. The good news is you can do these things in pairs. As you write Chinese you also read it; as you speak it you also hear it. The key to this strategy of course is tapping into multiple senses to build stronger associations in your brain which helps with retention. Interesting. I realise I’ve been using this method to teach my 2 year old to speak & expand his vocabulary! I used to do something like this when I was trying to maintain my high school French. Whenever I would read anything or think about something,I would translate everything into French. Pretty soon you get pretty goid at this and you develop a false sense pf your own competence. Because when I would meet native French speakers I would miss a lot because I was trying to follow them at my speed and actual conversation French is much faster than how I talk to myself. I’m not using this method for Chinese. Instead I just try to listen to native speakers rather than coming up with my own dialogue. David, I think the idea is to use this exercise to expand your vocabulary by identifying gaps in your everyday life. I do not think this is supposed to prepare you for listening to native conversation(or speaking at full native speed).